God creates man and woman, Adam and Eve. 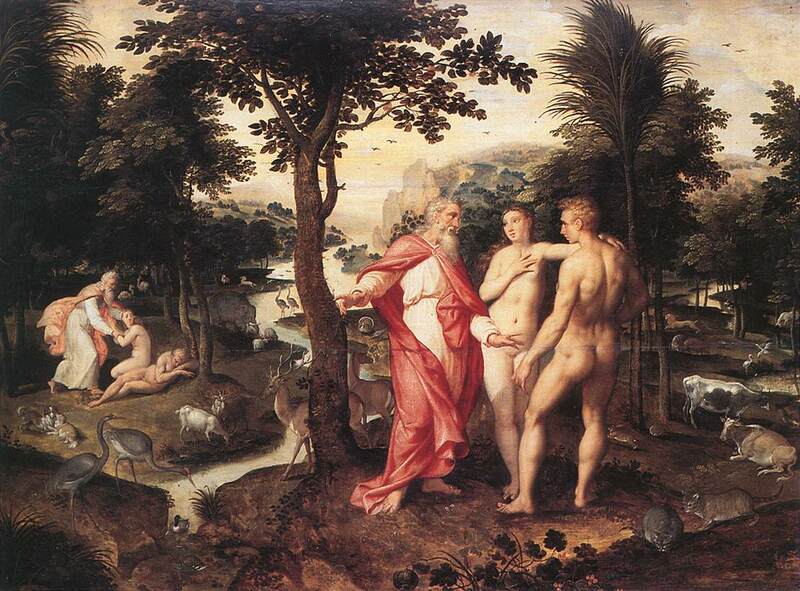 The creation of Eve is the most frequent scene. Artists represent the woman coming out of the right side of the sleeping man. She appears well formed and wide-awake; she looks at Adam but her body is often reduced to her bust and she is in a position of prayer. The man and the woman are in the middle of an enchanting garden, Paradise. This “park” a word derived from Avestic (Old Persian), has luxuriant vegetation and is full of wild beasts that co-exist peacefully with men and with other beasts. A fountain, out of which four rivers are flowing, is often represented. Adam and then Eve are always portrayed as adults, for they are created and not born. Adam and Eve are naked and beautiful and they live without working, in harmony with nature and beasts. The image of God Creator has evolved. At first represented as a hand coming out of the heaven, then as an angel, he takes a human appearance under the shape of a young man, like Jesus, and eventually that of a bearded old man who is sometimes clothed and wearing a tiara like the Pope. The first narrative of the creation of Man, “male and female he created them” (Genesis 1:27), is seldom represented but it has occasionally inspired artists, who place the man and the woman side by side. who hides her nakedness in her long hair, for she is a repentant sinner; she is often accompanied with a man’s skull, a sign of the vanity of life on earth. God creates man and woman. The creation is told twice. In the second narrative, God creates the man at first, then the woman. And the rib, which the LORD God had taken from man, he made into a woman, and brought her to the man. And Adam said : "This is now one of my bones, and flesh of my flesh: she shall be called Woman, because she was taken out of Man !" The two narratives are two ways of understanding the birth of man. The first one emphasizes the unity of mankind, created in God’s image. The second narrative puts the stress on the differences between genders and on the relations between man and woman. But for centuries, these texts have been understood as two successive moments of the same narrative, hence sometimes the idea of the creation of an androgynous man, both male and female; and subsequently that of two sexed beings. The creation of Adam from clay or dust is less frequent than that of Eve. Until the 14th century, God , wearing the face of Christ, models man like a potter or a sculptor. The creation of Adam from clay or dust is less frequent. God moulds man like a potter or a sculptor. Then He gives his spirit to Adam by a sort of ray or by a fluid transmitted through his fingertips. On the right, God assumes the features of an old man. A triangle indicates He is to be seen as Trinity. 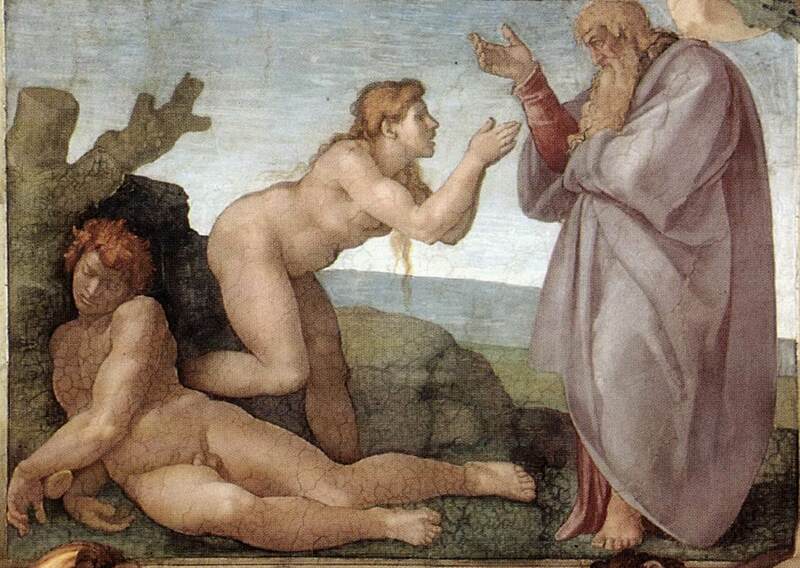 Michelangelo represents the creation of Eve in a fairly classic manner but gives a new dimension to that of Adam. The Creation of Eve; MICHELANGELO Buonarroti; 1509; fresco; Sistine Chapel; Vatican. Eve, created from Adam’s right rib, traditionally comes out in a position of prayer; in Ghiberti, she soars up. Adam and Eve are part of a luxuriant nature. The Garden of Delights; Hieronimus BOSCH; c. 1500; oil on panel; left panel of a triptych; Museo del Prado, Madrid. 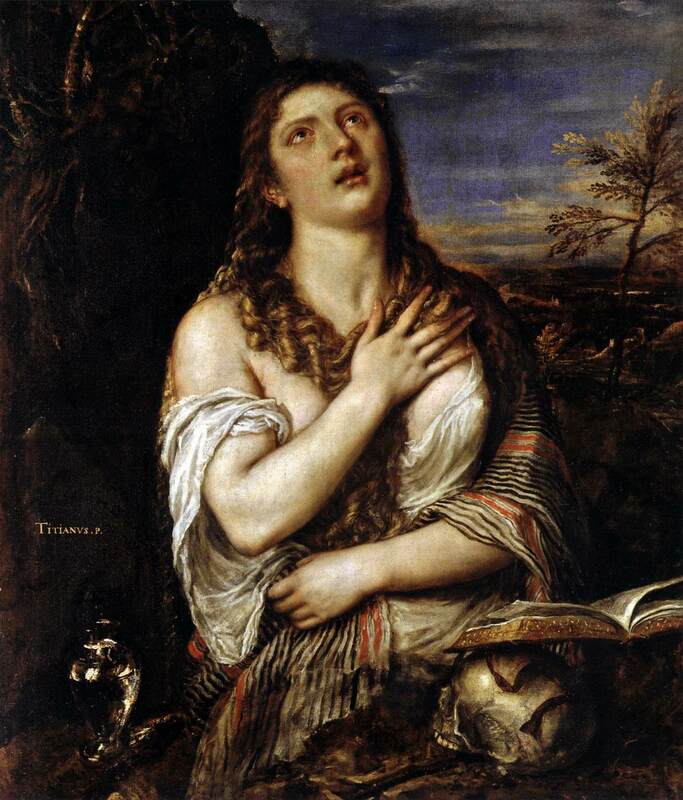 “[She] is …flesh of my flesh” (Genesis 2:23), Adam says when he sees Eve. The first human couple speak with God or alone and face each other. 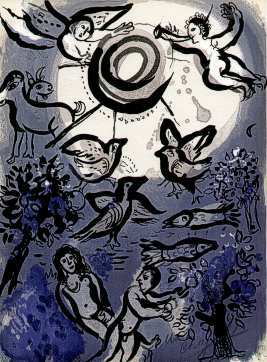 of species and of the origin of man, the narrative of Genesis and its representations full of imagery have become exlusively symbolic but they are at the basis of certain attitudes or beliefs outside any religious context. The idea is that man is both material (clay, dust) AND spiritual (God’s breath, the spirit), body AND soul. The idea is that man is not a second-rate element of Nature but rather its highest achievement. This assertion is at the basis of the whole humanist thought. also exists in certain traditions of Hellenistic and Roman antiquity. Prometheus is said to have moulded man like a potter with some earth and water and Athena is said to have given him life.